This capricious act by 42-year-old Mayor Hirofumi Yoshimura will not hurt nation brand Korea or nation brand America, but he is hurting city brand Osaka, a city that yearns to be as famous and loved as its “big sister” San Francisco. San Francisco holds the iconic City by the Bay nickname. Seaport cities are proverbially known for comprising more open-minded and tolerant dwellers, in part because of the comings and goings of diverse people from all walks of life that one must engage with in business and daily life. 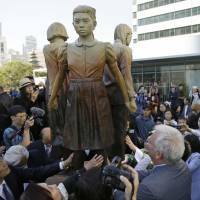 The mayor of Osaka has personal opposition to the installation of a comfort women statue, but that matter is done. His feelings shouldn’t drive the business and diplomatic ties between these two cities. The statue in dispute is located in San Francisco’s Chinatown. 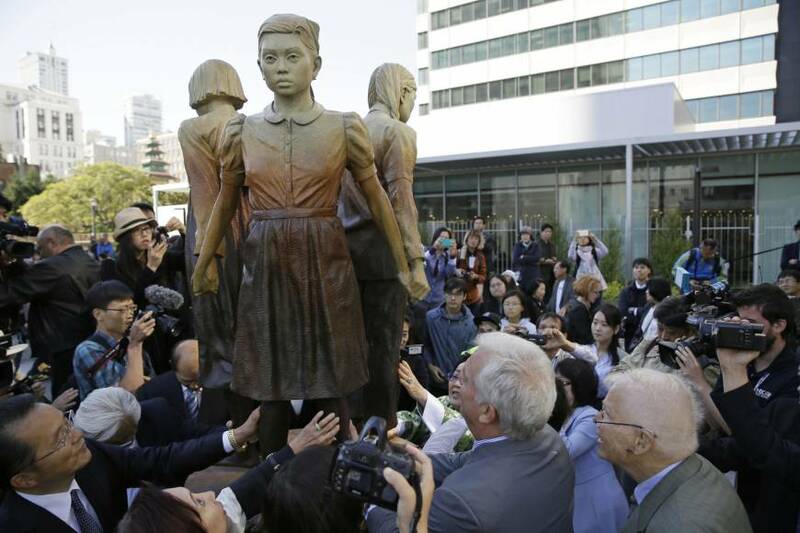 It consists of three girls — Chinese, Korean and Filipino — standing hand in hand with a grandmother survivor looking on. The term “comfort women” refers to women and girls who were sent to work in Japanese wartime military brothels. Just as Civil War memorials are coming down, this comfort women memorial is among a growing number going up in the United States, to include Glendale’s Central Park in California, a Comfort Women Memorial Peace Garden in Fairfax County, Virginia, and Brookhaven, Georgia, a northeast suburb of Atlanta and one of the most active cities in human trafficking. San Francisco is the first major international city to embrace the comfort women cause for recognition and remembrance. This is a tale of two cities through the eyes of two mayors. Sixty years ago, the Greek-American immigrant George Christopher led the mayoral effort to establish the San Francisco-Osaka Sister City Association in 1957. The association is San Francisco’s oldest sister-city relationship. Christopher was a liberal Republican mayor whose legend is attached to his bringing San Francisco into the big leagues, figuratively and literally. He convinced the New York Giants baseball team to move to the “New York of the West Coast.” The warmer climate was one appeal, along with the diverse and competitive business environment, and the promise to build Candlestick Park, which was erected next to San Francisco Bay. He presided over much city revitalization, including Japantown (“Little Osaka”), in the Western Addition district. Now Osaka’s mayor is behaving like the miffed little brother in this city relationship by picking up his marbles to go home. This is sibling rivalry with nation brand image implications, much worse for Japan than for the United States or South Korea. Like some of his kin in the Diet, the Osaka mayor doth protest too much. His words serve well the cause to criticize Japan for not giving full airing to the comfort women. The more Japan complains, the more attention it draws to the activism around the issue. Comfort women is an internet meme as much as a horrible episode in history. If one wants to use a short-circuit version of information war attacking, Google these two words and see who comes out the victor in the rhetorical battle. It’s not Japan. Why? Because people in power, like Osaka’s mayor, continue to use self-defeating persuasion tactics to suppress debate and dialogue. You don’t win a persuasive appeal or argument by leaving the room, giving the cold shoulder or charging that all your opponents are led by one-sided arguments and emotional appeals. You stay, collect your marbles and keep competing. This is how Christopher won over the Giants. Yoshimura is now keen to win the Osaka bid for the 2025 World Expo, a six-month event expected to attract 28 million visitors from across Japan and the world. Let’s hope he will have a change of heart and follow Christopher’s path.